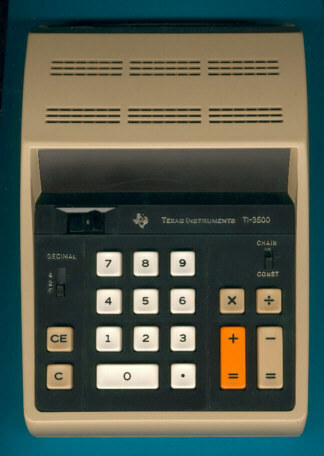 The TI-3500 desktop calculator was introduced together with its sibbling TI-3000 and the famous datamath (TI-2500) in September, 1972. With these calculators Texas Instruments started the business of selling calculators under their own brand. Find a reprint of the Press Release about the introduction here. In addition to the TI-3000 you'll notice a wider display with 10 digits and two sliding switches to select between CHAIN or CONSTANT calculations and to adjust the position of the decimal point. The next step in the evolution of the TI-3000, TI-3500 line was the TI-4000. Don't miss the rare TI-450 with enhanced capabilities. Compare the styling of this TI-3500 with the uncommon but otherwise identical TI-340. If you need a clock/calculator combination, the TI-3510 is the perfect choice. Ever thought about a name similar to the Datamath for this calculator ? Yes, it was announced as Deskmath LP3500 but released as the well known TI-3000. Don't miss the Deskmath LP3000 from the first production of the TI-3000. The design of the TI-3000 was heavily influenced by the Canon L100A. A more powerful desktop calculator was introduced with the TI-450, a slightly different housing was used with the Radio Shack EC-2000. Don't miss the TI-150, the only pocket calculator with the Panaplex display.